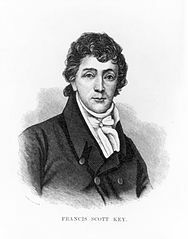 Francis Scott Key, a Democratic Party activist whose reputation has been hijacked by the Republicans. Francis Scott Key served as a close adviser to Democratic Presidents Andrew Jackson and Martin Van Buren, and as U.S. Attorney for the District of Columbia from 1833 to 1841. Both in life and reputation he is hardly lacking in honors, being both the author of our National Anthem, and our National Motto which appears on all U.S. currency. And yet the Republican Propaganda Machine has been strangely successful in promoting the absurdity that Republicans are somehow more patriotic than Democrats. Most people seem to think that Key was a Republican even though he died before the Republican Party was founded. So let’s forget Republican mythology and honor properly a great Democrat!